MEXICO CITY, Jan 17 2013 (IPS) - Latin America’s big cities should cooperate with each other in order to overcome shared challenges in transport issues, such as sustainability and a more human-centered approach to urban development, experts say. “Challenges in the cities are very similar. Car use was favoured and the cities’ growth suffered from planning deficiencies, and now they have to make the public transport sector a priority,” Bernardo Baranda, Latin America regional director for the U.S. Institute for Transportation and Development Policy (ITDP), told IPS. “Cooperation is an interesting approach, because a lot can be learned from what other cities are doing. Nowadays projects are being taken up to give priority to public transportation, improving quality and giving users alternatives so that they leave their cars at home,” he said. On Tuesday Jan. 15, ITDP and eight other international organisations presented the 2013 Sustainable Transport Award to the Mexico City Federal District, the country’s capital, which was represented by the city’s heads of Transport and Highways and of Environment, Rufino León and Tania Müller, respectively. Nine million people live in the Federal District, and 20.4 million in the Mexico City metropolitan area, which spills over into part of the adjacent state of Mexico, one of the 31 states in the country. The size of its population puts Mexico City in third place among global megacities, after Tokyo and Delhi, according to the United Nations. The other four finalists for the award were the cities of Rosario, Argentina; Rio de Janeiro, Brazil; Bremen, Germany; and Kiev, Ukraine. They had been selected from among nine candidates in eight countries. 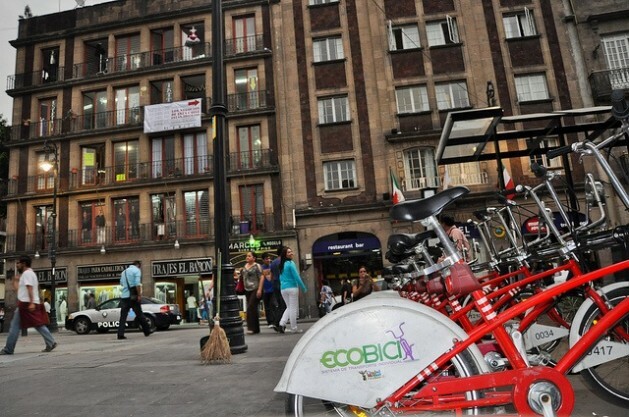 ITDP and the Centre for Sustainable Transport-EMBARQ nominated Mexico City in August for adding an extra route to the Metro Collective Transport System, extending the public Ecobici bike share programme, and installing parking metres in some neighbourhoods. In 2012 the cities of San Francisco, California in the United States and Medellín, Colombia shared the award, while in 2011 the winner was Guangzhou, China and in 2010, Ahmedabad, India. Consultant Roberto Remes told IPS that the award for sustainable transport is a special opportunity for Latin American cities – nominated or not – to get together to share their experiences and discuss possible solutions. “Best practices are an incentive, but one must understand that suppliers of technology carry out intense lobbying that is not always in line with best practices. This leads to governments looking for ways of using the technology, instead of looking for a solution for a specific problem, which is a flawed approach,” he said. “It would be better for governments to act according to state-of-the-art knowledge and best practices,” Remes said. In April 2012, Metrobus Line 4, covering 28 kilometres in the Mexican capital, came into operation, expanding the bus rapid transit (BRT) system that uses dedicated lanes, while Metrobus Line 12, covering 24 kilometres, opened in October 2012. Ecobici, the bike share system launched in 2010 by the metropolitan government, has nearly 50,000 users who have made close to five million trips. The scheme has 264 bike stations and 3,670 bicycles in the centre and west of the capital. Finally, the Ecoparq system of parking metres has been in operation since January 2012 in two neighbourhoods in the west of the capital, and is about to expand into other areas. These measures taken by the leftwing Party of the Democratic Revolution (PRD), which has governed the Federal District since 1997, seek to reduce the use of private vehicles that leads to chaotic urban transport, and create environmental benefits such as pollution reduction. In the metropolitan area of the Valley of Mexico, where the Federal District and several municipalities of the adjacent state of Mexico are located, citizens make 49 million journeys daily, 53 percent of them on public transport and 17 percent in private vehicles, according to the Centre for Sustainable Transport-EMBARQ. The creation of BRT-type systems in the region’s megacities has shown a marked increase over the last decade, to the point that they now exist in at least 17 cities. The same has happened with public bicycle share programmes. The award is “a recognition and a call for continuity, to make (the programmes) more aggressive in the coming years, in order to give citizens better transport options,” Baranda said. “There is still a great deal to be done to integrate different modes of transport, to make it easier for users to change from one mode to another,” said the ITDP regional director, who is currently negotiating a collaboration agreement with the capital city government. In 2009, transportation expert Carlos Pardo wrote a report titled “Los cambios en los sistemas integrados de transporte masivo en las principales ciudades de América Latina” (Changes in integrated mass transport systems in the major cities of Latin America) for the Economic Commission for Latin America and the Caribbean (ECLAC). In it he identified challenges in this field among cities in the region, including integration and coherence with other modes of public transport, with non-motorised transport, with urban policies and with public and private investments in public transport, and the corresponding priorities. The study also discusses the need for synchronising project execution timing and politically determined timing; and the importance of feasibility studies and the analysis of alternatives, in order to carry out projects that are successful in the medium to long term. In 2012, Rio de Janeiro, which has 11.8 million people and is the Brazilian city with the second highest population after São Paulo, opened its first BRT corridor, called TransOeste. It also expanded the shared bicycle programme it launched in 2011, and started a project for improving public spaces. The Argentine city of Rosario, which has nearly 1.2 million people, has concentrated on improving transport, the bicycle programme and public spaces. In October, ITDP presented a plan titled “Perspectivas de crecimiento de la red de Metrobús y transporte integrado del Distrito Federal a 2018” (Prospects for growth in the Metrobus network and integrated transport in the Federal District to 2018) which proposes annual growth in the system of between 25 and 30 kilometres and the addition of 10 new routes by 2018, benefiting some two million additional passengers. This year, the Mexico City government intends to extend the Metrobus and Ecobici systems, strengthening multimodal integration. “We have to make the leap to an integrated transport system. The modality and the route do not matter as much as the user having access to a system of smooth transfers, with discounted fares. The connectivity of all the systems is very important,” said Remes.